Explain this to me Kabam….! Lower Efficiency and same Vitality, but a lower overall score?????! Kudos for the KoM wizard who has an explanation for that…..*sigh* talk about hidden game mechanics! This entry was posted in Blog, General by beardmonkey. Bookmark the permalink. Campaign scores are based on 4 numbers: troops fighting(e), goblins fighting, troops dying(v) and goblins dying. If all troops die, if e=v, the score is zero. Only when all goblins die is there a positive score, so for scoring purposes a single number represents goblins fighting and those dying. If troops and goblins both survive, more rounds of fighting follow until one side is wiped out. There is a key difference with the Boss on each level. When all troops die, the surviving goblins remain instead of resetting to their original levels. The score for this battle is zero, but another battle is possible. 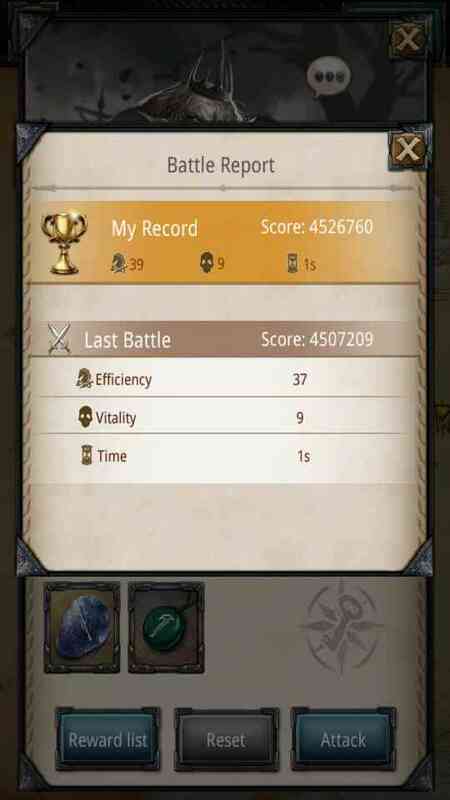 When you send more troops, this second fight is scored like any other, using efficiency, vitality and number of goblins. 160 million points on the map searches smouga. . Here is how to explain …? 92 server, the player low lvl. I found at one point that with additional defensive rune I was able to have my score go up but my vitality stayed the same. One of the attacks was most likely a double hit, something possible only on boss levels. Score is figured on the basis of the second hit alone, though they show the combined efficiency and vitality of both hits. My question is how can i use the exact same troops with same hero and same buffs back to back…and get 2 different scores?? The same attack, slightly different score happens to me all the time. Usually not radically different though. I often get a new high score the 2nd time I attack using the same troop configuration. There must be some sort of randomizer in the calculations. thats because of a small random element in the battle mechanics, so always be sure you actually got the best score with a certain set-up! There is a randomiser element to CHS on every map, something that is unexplainable in the battle mechanics and cant be replicated with any CHS calculator.